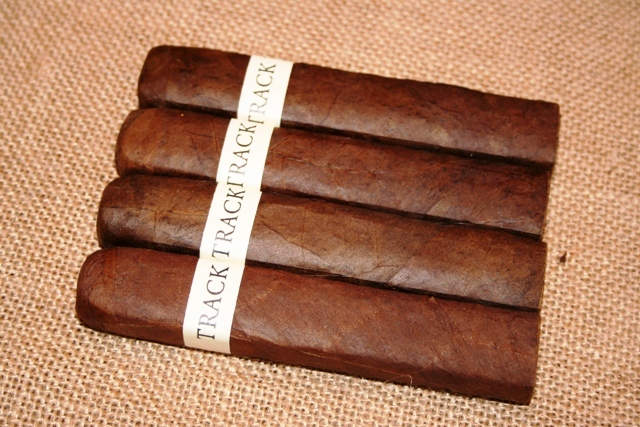 Here is the latest from Flatbed Cigar Company. The new TRACK 7 label. A beautifully balanced, box pressed cigar. Constructed with an Arapiraca Maduro wrapper with Dominican Ligero, Seco and Nicaraguan Ligero filler. Binder is Dominican. Arapiraca is the Municipality in Brazil where this wrapper is grown...and now considered the Cigar Capital of Brazil. This wrapper is a bit more "Earthy" than the Mata Fina, and lighter as well. I think you will really enjoy this cigar. It is a 5x60 that has been box pressed. I’m following Katman’s advice and letting these babies get some humidor time. I only received them a week and a half ago and probably won’t smoke them until February. I’ll let you all know then how it works out. Thanks for checking with me. I bought this cigar based upon Phil Kohn's (aka Katman) stellar review. He let them rest "6-8 weeks" I had only a week on the one I smoked. Bad move. Burn issues, draw incredibly loose, no transitions, terrible taste; just plain frustrating! Also forgot to use my Katman promo code (my bad). Check back in a month when I smoke #2. I'm expecting this cigar to be a completely different smoke. Another great smoke by Flatbed. Fantastic construction as always, clean cut on this chunky box press and ash hung very tight. The draw was a little loose like most 60 rings but the smoke was ample and the body was at least medium to full. The strength built as the cigar progressed. The flavors were hard for me to pin down, but I picked up on coffee, a mild sweetness, nice tobacco flavor, and a touch of pepper and leather. The retrohale was unimpressive to start but once the cigar reached the end of the 1st third a lot of nice smooth pepper on it and it just seemed to get better and stronger as the smoke progressed. Very nice cigar. I discovered this cigar while trolling cigar reviews on YouTube. I came across a review by Caroline at Cigar Cigars, and she raved about it. It was almost sensual, her love of this cigar, so I had to give it a shot. I smoked one of these as soon as it arrived in the mail, and I was badly disappointed. It must have been a bad roll. I decided to give the others a month to settle in my humidor before submitting a review. I'm pleased to report that this second cigar pleased me as much as it pleased the other reviewers here. Like Caroline and others, I find it difficult to describe everything about it, but I do believe it presented earth and caramel. It was mildly sweet. Additionally, it produced a rare, mild, but pleasant burning sensation at the back of my tongue, almost in my throat. Uncommon in my experience. It lasted for a longer time than I expected, going for close to 80-90 minutes. My only complaint is the burn line. Others had better luck, but this stick burned unevenly, and that forced the ash to go crooked. I touched it up 3 times. This is why I can't rate this above a 4, though, flavor-wise, it rates higher. One last note. This is said to be a 60 gauge cigar, but it looks and feels narrower, more like 56. I would like to see this in a toro. I suspect it would be even better. This is a unique and pleasant cigar. I'll be going back to Flatbed.